The photo is a little washed out from too-bright sunlight. I am learning.... and hey you get a good view of the quilting in this shot, right? If you want to see it in better light, click here. Much better, huh? My partner asked for "romantic pinks and greens" and I really like how this turned out. The star block was improvised, meaning I did not do any math before starting it (or while making it, really). I just started out with a 5 inch square and went from there. I tried to make the pink triangles just fit the rectangles they are a part of, and because of this they don't have the "proper" angle that is usually found in this type of block. 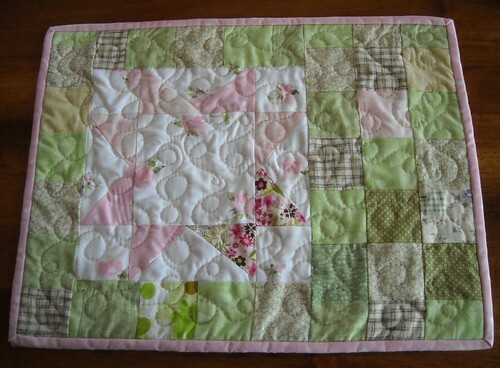 This quilt was made completely from fabrics in my stash. I think if I did it again I might go get a couple of new greens because a couple of them don't blend really well. But overall, I do like it and think it turned out ok even if some of the greens were a little off. This is my second UFO finish for the spring to finish challenge. 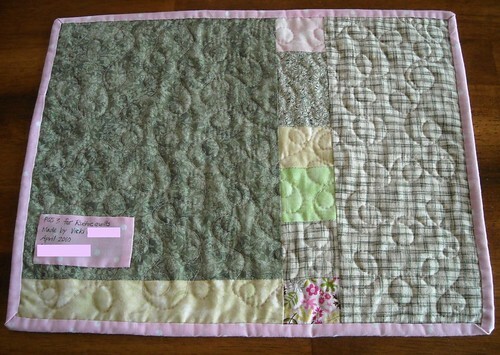 I am working on finishing the binding for a 3rd and have the binding ready to attach to a 4th project. It feels good to get things done! 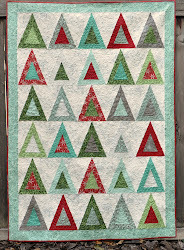 That is just adorable, and the quilting is lovely. I'm sure your partner was thrilled to receive it. this is really cute and I absolutely adore your new header!! This is adorable! We love the modern pattern and the great colors! Thank you for sharing your wonderful blog; keep up the fantastic work, we look forward to seeing more from you in the future. That is so beautiful. The colors are very romantic! I love the special details you add to the back! Nice job! I hope your partner loved it and good job stash busing!